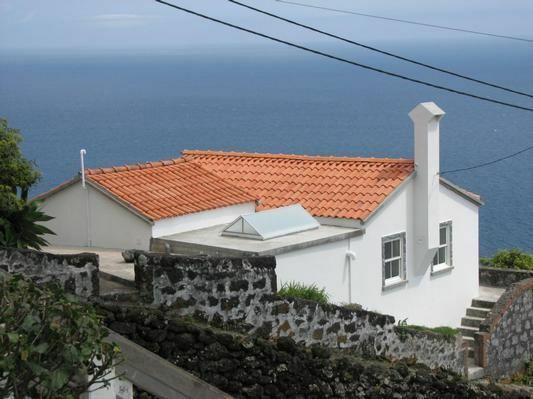 Casa Ita is a converted, newly renovated, typical Azorean house above the coast with beautiful sea views. It is located in the small village of Pontas Negras on the south side of the island of Pico. The house is divided into: - bright living room with dining table for 4 persons and wood burning stove. The couch can be converted into a fully-fledged double bed (1.60 x 2.00) in a few simple steps - the open kitchen fits perfectly into the room with its light wood - the bedroom has a double bed (1.60 x 2, 00) and wardrobes - the bathroom is equipped with shower, toilet and bidet. A large skylight lets in a lot of brightness. The kitchen is fully equipped with gas stove (4-burner with oven), extractor hood, refrigerator, coffee maker and crockery. There is the possibility to use a washing machine. Internet access is guaranteed via WLAN. Outside, there is a terrace which invites you to relax. Here you can enjoy the magnificent view of the volcanic rock embossed coast. Very often dolphins and whales were spotted from here. In the evening you can do a barbecue on the terrace and plan the next exiting day. What do you prefer to do? Hiking, whale watching, sailing, pico-climbing, swimming, snorkeling, diving, fishing, relaxing, etc. There are a variety of ways and we are happy to assist you in the selection with suggestions. In 5 minutes you can reach the natural beach on the coast. Another swimming area is located in the neighboring town of Sta. Cruz. On Pico you can go to natural swimming places for swimming, snorkeling and diving. Even in the small fishing ports, swimming is possible. Pontas Negras is a small village on the south side of the island of Pico with about 70 inhabitants. The center is the 1950 built church "Nossa Senhora da Fatima". In the café of the place you can have a good espresso. The café also has a small supermarket. It is opened every day. Here you can also order your bread rolls, which are delivered every day (except Saturday). In the neighboring town of Sta. Cruz there is the restaurant of the local sports club and a public swimming pool. In the district town of Lajes do Pico you will find post office, banks, supermarkets, bakers, restaurants, shops, whale watching companies and the whaler Museum. Pet (per object and day, price includes 0 EUR). Firewood (per object and day, included in the price 0 EUR).